A recent study found that 88% of female adolescents wore a bra during sport that did not fit correctly, while 85% failed a simple knowledge test on bras and bra fit1. 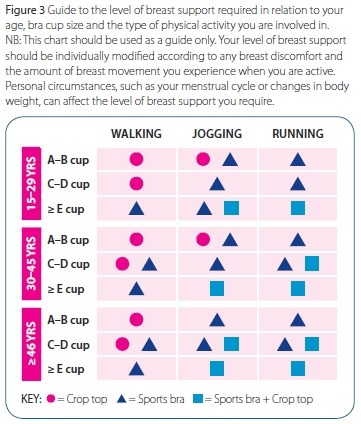 This fact sheet aims to provide easy-to-understand information on how to choose a bra suitable for physical activity and to tell if it fits you properly. Hopefully this information will ensure that the next sports bra you buy is the right size, provides you with good support and, most importantly, is comfortable. 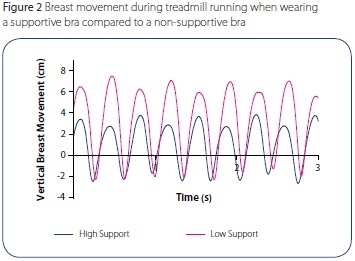 Why wear a supportive bra during physical activity? As breasts can be heavy, the force created by them can pull your trunk forward, making you slouch. This can negatively affect your athletic or sports performance, and lead to headaches and neck, back and arm pain. Research has shown that during activities such as running and jumping, bare breasts move up and down as much as 12 cm. This is due to insufficient anatomical support within your breasts. Excessive breast movement during exercise is often associated with breast discomfort and can be embarrassing for some females. As both of these factors have been shown to be barriers to physical activity, breast support should be made a priority and bras regarded as essential pieces of sporting equipment, rather than just underwear. 16D breasts weigh approximately 600 grams each. That’s as much as 1.2 litres of milk hanging from the front of your chest. The amount of breast support needed varies with age, bra size and the type of exercise. Breasts are primarily supported by the skin covering them. Elasticity of the skin decreases with age which, in turn, reduces the support it can provide. This means that older women require greater support from their bras, especially after pregnancy. Females with larger bra sizes have heavier breasts and therefore require greater support from their bra. Different types of exercises cause different breast movement. 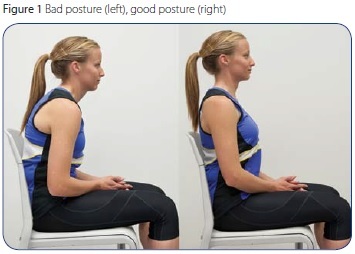 Exercises with more vertical movement of the body (e.g. horse riding compared to bike riding; jumping compared to walking) or movements involving rapid lower limb movement (e.g. running compared to walking) cause more breast movement and, therefore, require greater breast support. Women with bra cup sizes D+ might require two bras (sports bra plus a crop top) to achieve enough support. Which bra should I wear? If only a low level of breast support is needed (e.g. if you are young, have small breasts and are walking), a crop top might provide sufficient breast support. However, if a high level of breast support is needed (e.g. if you are older, have large breasts and are running) a highly supportive sports bra or even two bras may be required (e.g. a sports bra and crop top) to achieve enough support. A supportive bra should minimise breast movement. Ideally your breasts should move in unison with your torso and not bounce excessively by themselves. The less they move, the better. However, some supportive bras can be uncomfortable. You need to try and ensure you have a supportive bra that is also comfortable to wear. Needs to be made of strong, wide elastic material so it can support your breasts without riding up. Larger bra sizes require wider bands. Should be wide and padded for comfort so they don’t dig into your shoulders. Your breasts MUST be completely covered or encased in the cups to effectively limit breast movement. If a bra has underwire it MUST fit the shape of your breasts correctly. Soft breast tissue is not designed to tolerate underwire digging into it. If it is not possible to find an underwire bra that fits correctly, choose a non-underwire (soft-cup) bra instead. The centre of the bra between the cups should sit on your breast bone, not on your breast tissue. Should be able to wick sweat away from your body to keep you cool but not irritate your skin. Crop tops shouldbe made of strong elastic material that can compress your breasts firmly against your chest. Research has found many females wear bras that are past their used by date, where the elastic is stretched and the material is worn. Are you one of them? Any supportive bra MUST fit correctly. If it doesn’t fit, it won’t provide adequate support. Ill-fitting bras contribute to neck, back and arm pain, especially in females with larger breasts, so make sure your bra fits you well. Fit the band correctly first, ensuring all of your breast, especially under your armpit is in the cup. Adjust the straps, then check for any wrinkles/gaps or bulging of the cups and go up or down a cup size accordingly. Check the underwire fits your breast shape correctly. If not, start these three steps again with a different bra. Band – Not too tight; no flesh bulging over the top of the band (i.e. too small); doesn’t ride up when you arms are raised (i.e. too big). Ideally you should fasten a new bra on the loosest hook so you can tighten it up as the bra stretches with age. Straps – Comfortable, not digging in; not sliding off. Cup – No breast bulge over the top of the cup (too small); no wrinkles or gaps in the cup (too big). Underwire – Sits on your ribs, not on your breast tissue at the front or under your armpits (too small or the design does not fit your breast shape). Front band – Sits flat against your breast bone. 1 McGhee DE, Steele JR & Munro BJ. (2010). Education improves bra knowledge and fit, and level of breast support in adolescent female athletes: A cluster-randomised trial. Journal of Physiotherapy. 56(1), 19–24. 2 McGhee DE & Steele JR. (2010). 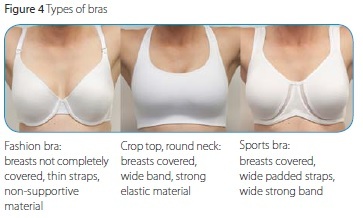 Optimising breast support in female patients through correct bra fit: A cross-sectional study. Journal of Science and Medicine in Sport. 13(6), 568–572. 3 Greenbaum AR, Heslop T, Morris J, Dunn KW. (2003). An investigation of the suitability of bra fit in women referred for reduction mammaplasty. British Journal of Plastic Surgery. 56(3), 230–236. 4 Mason BR, Page KA, Fallon K. (1999). An analysis of movement and discomfort of the female breast during exercise and the effects of breast support in three cases. Journal of Science and Medicine in Sport. 2(2), 134–144. 5 Robbins LB, Pender NJ, Kazanis AS. (2003). Barriers to physical activity perceived by adolescent girls. Journal of Midwifery and Women’s Health. 48(3), 206–212. 6 McGhee DE, Steele JR & Munro BJ. (2008). Sports Bra Fitness. Wollongong NSW: Breast Research Australia (BRA), Biomechanics Research Laboratory, University of Wollongong: ISBN 9781741281552.
information contained within it or your use of that information.